This video has been making the rounds. 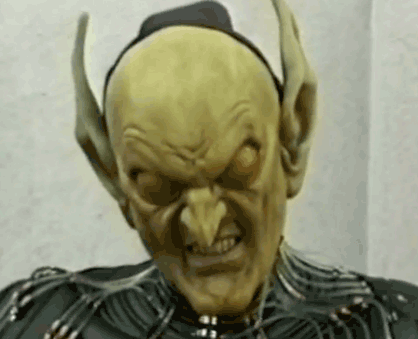 Take a look at one of the options that was considered for the portrayal of Green Goblin in Raimi’s Spider-Man. This is an all make-up approach. It is made of a flexible mask which the actor manipulates with his facial expressions. This has a lot of great things going for it. Least of which that it actually moves and emotes. But in retrospect if this approach had been chosen we would have missed out on some of Willem Dafoe’s brilliant performance. It really is difficult to tell how the movie would have turned out had it gone with this instead of the static face mask. Take a look. Very interesting! I liked the idea of the battlesuit, but this? This… could possibly have worked! I think that Willam Defoe’s would have been amazing, and we would have seen facial expression instead of him just tilting his head and waving his arms around.